For this month's Food'N'Flix, we watched Like Water for Chocolate, picked by Elizabeth at The Law Student's Cookbook. I remember reading that book years and years ago...and seeing the movie when it first came out in the early 1990s. Being a passionate cook, the connection between emotions and food appeal to me. A lot. Click to see Elizabeth's invitation...you still have time to join the fun. This post contains an affiliate link for the DVD at the bottom. This is a movie - like last month's selection - that I haven't seen in, probably, two decades. And, at the time, I had just finished reading the book which I adored. It was nice to see this movie again with a few more decades of relationships under my belt. I'm not going to say too much about the events in the movie. But I'll set the scene. Set in a Mexican border town, in the early 1900s, Tita and Pedro are a young couple madly in love. But they can never marry because Mama Elena, Tita's fear-inspiring mother, forbids it; she insists the duty of her youngest daughter is to stay at home and take care of her until the day she dies. What a lovely tradition! (I write that dripping with sarcasm...just in case you thought I was serious.) Pedro, instead, marries Tita's oldest sister - to stay close to Tita. Tita's kitchen becomes the nexus of meals that can fill diners with lust, grief, or nausea, depending on the cook's mood. We first see this when Elena orders Tita to create Pedro and Rosaura's wedding feast. Tears flood from her eyes into the batter of the wedding cake. Suffice it to say, everyone who ate the cake was overcome with grief, lamenting their own lost loves. It is another of these food-begets-magic scenes from which I drew my inspiration for this Food'N'Flix post. Pedro gives Tita a bouquet of roses to commemorate her first full year as the ranch's head cook. 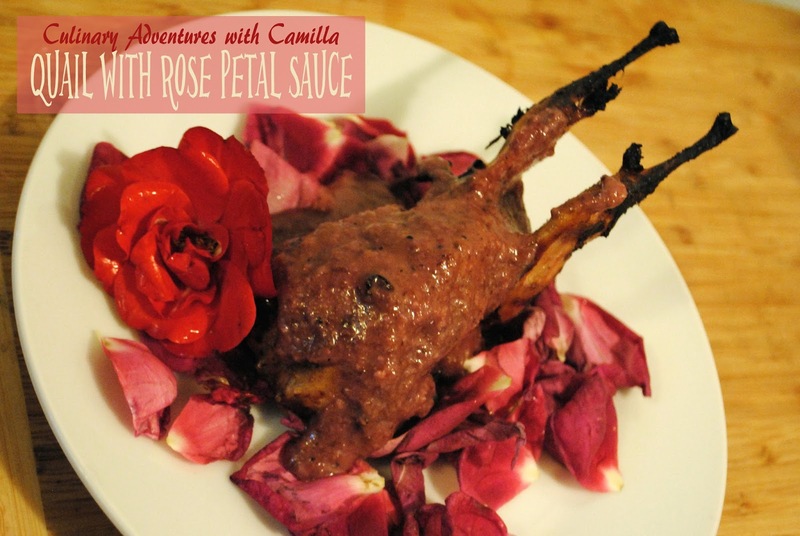 Though Elena demands that Tita get rid of the roses, Tita transforms them into a rose petal sauce that she spoons over roasted quail. The dish is voluptuous, fragrant, and utterly sensual. And those who eat it overheat with passion. Tita's other sister, Gertrudis, literally begins to smoke. When Gertrudis runs into the bathhouse to take a shower and cool off, the building bursts into flames! That's all I'm going to write about the movie. 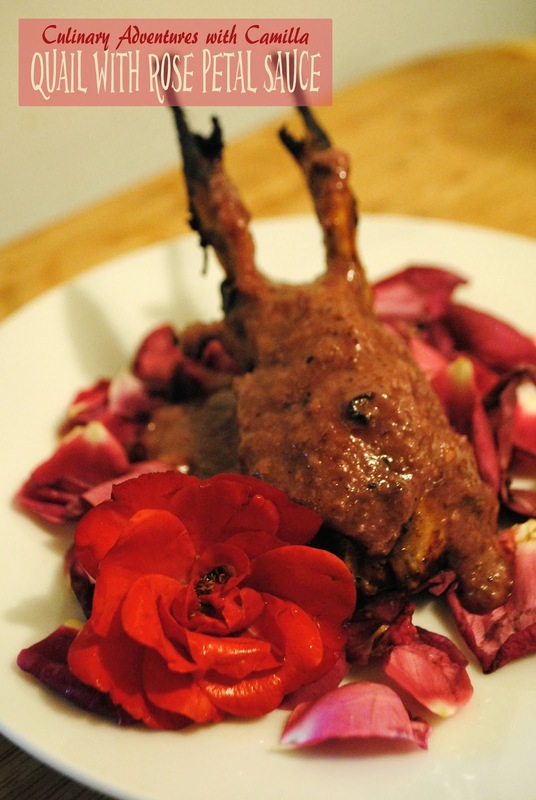 Now on to my dish, what I'm calling Passion-Igniting Quail in Rose Petal Sauce. 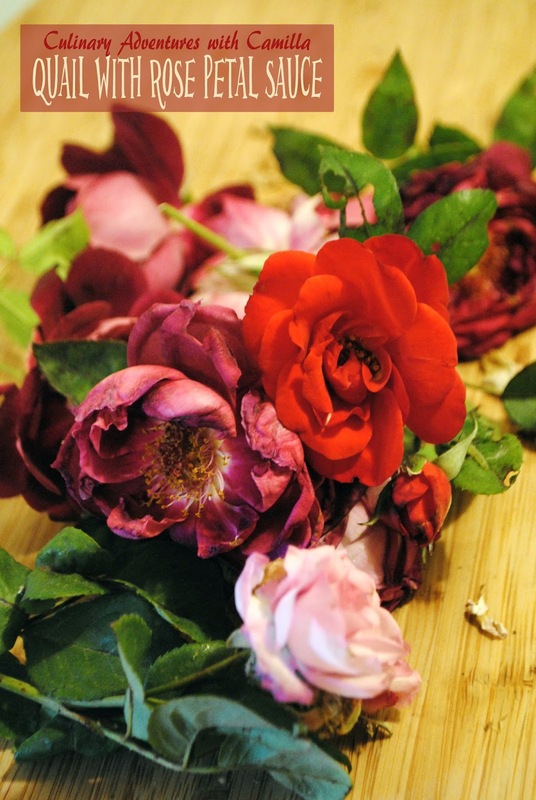 As always when I need to cook with flowers, I put a call out to my favorite local gardeners. Three friends offered me some, but Belle was closest. So, I ran over to pick up a few blooms. Bonus...Randy loaded up bags with chard, peppers, arugula, and some Chinese veggies. Score! But I really, really appreciate the gorgeous roses. 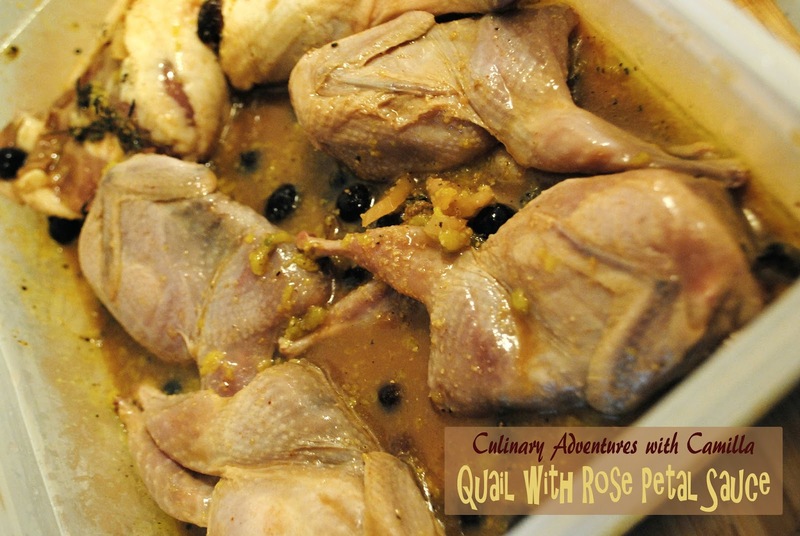 To create this dish, I marinated the quail overnight. Do this the day before you plan to serve it. 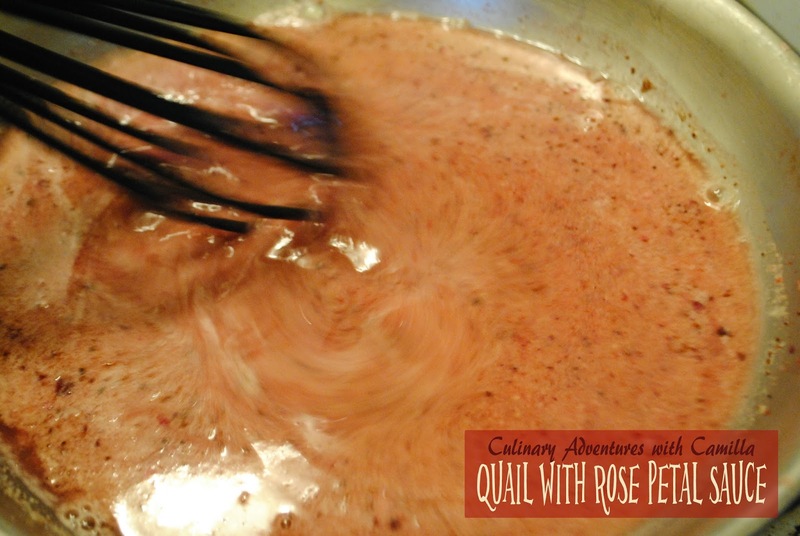 Whisk all of the ingredients, except for the quail, together. Spoon the mixture over the quail. Marinate for at least 8 hours. Flip the birds after 4 hours. 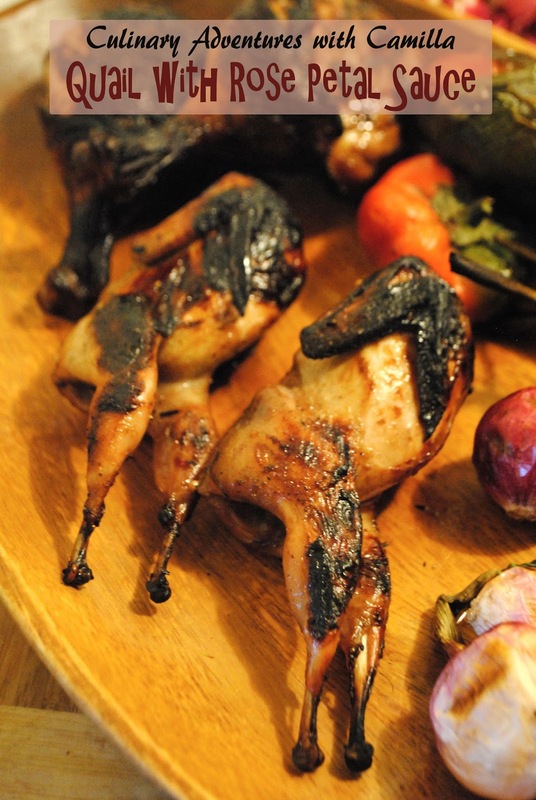 Grill the quail till desired doneness. Sorry, I don't know too much about it...I hand it to my husband and it comes back grilled to perfection! Thanks, my Grill Master. Thanks, my Love. While the quails are grilling, make the sauce. I adapted this from a rose petal sauce I found that used prickly pear tunas. I searched the farmers' market and even went to a local Mexican market. There were no ripe prickly pears to be had. Bummer. But this version was delicious. 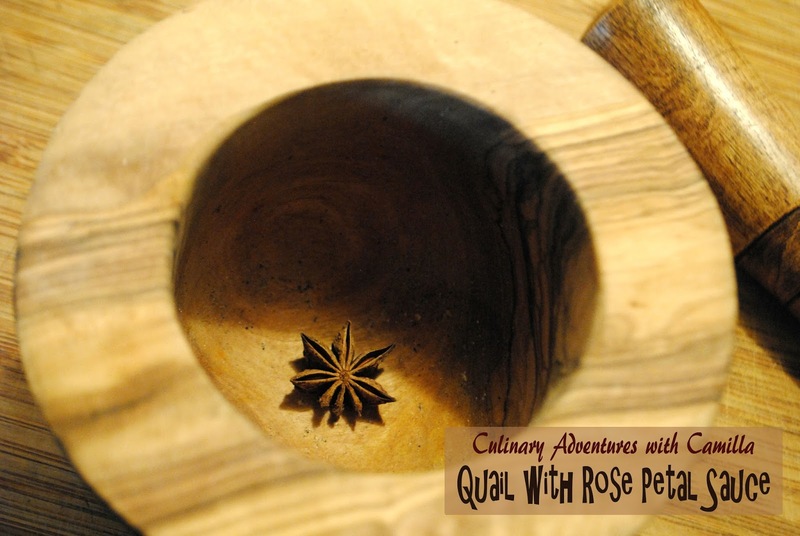 Crush star anise pod with a mortar and pestle. In a blender, combine the plum, rose petals, garlic, star anise, honey, cinnamon, and ground almonds. Pour in just enough broth to cover the ingredients. Cover and process until smooth. 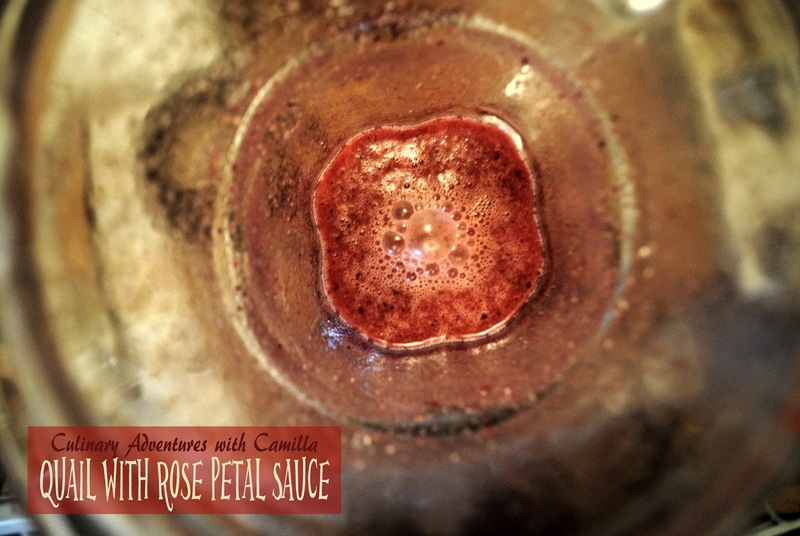 Pour the rose petal mixture into the saucepan with the remaining broth. Cook over medium heat for about 10 to 15 minutes, stirring gently. The sauce should reduce by half or so. Taste and adjust seasoning with salt and pepper. 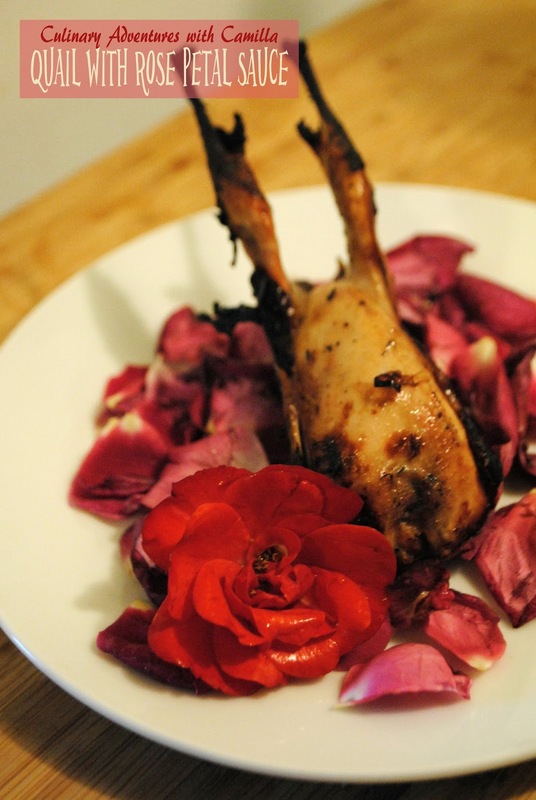 To serve lay the grilled quails on a bed or rose petals and spoon the sauce over the top. That's all for now. I'll be hosting next month. Check back to see what we're watching and cooking. Obviously, I am reading backwards today. You did it! I am impressed beyond measure. Truly lovely dish, Camilla. I considered making this too, but I was too intimidated about cooking with flowers. This looks beautiful and I'm so glad you made it! Thanks! Don't be intimidated...just have fun with it. 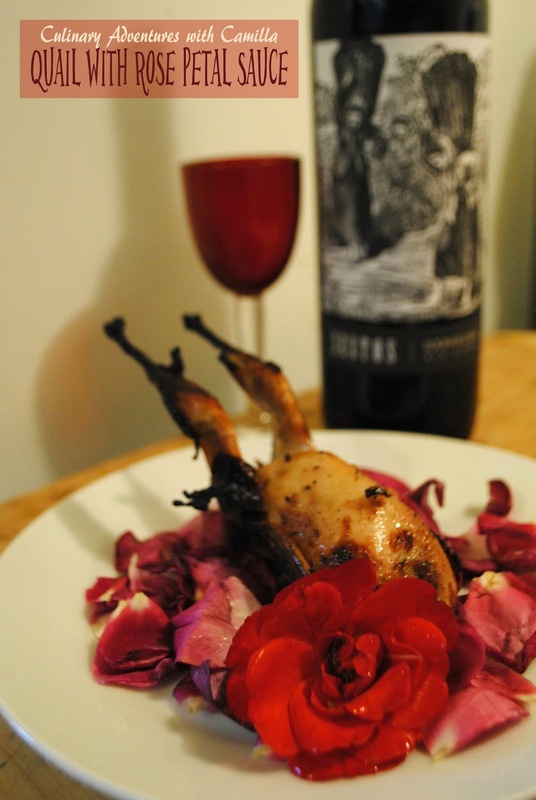 Love quail (although never made it myself) and love the name of your dish, looks just wonderful. Great job...I am going to make this dish for sure...I was thinking perhaps for Valentine's Day. Such a gorgeous plate Camilla! I need friends with roses. ;-) I am in love with the flavors in the sauce--so delicate and sensual. Great pick.